Shed will fit under most eaves and you will be surprised how much you can store in it!!! This popular YardSaver garden shed has a flat roof and a 630mm wide single hinged door at the front. 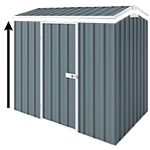 The zinc YardSaver F42 steel garden shed is a very affordable small slim line storage solution when space is limited.